Nottngham July 12 (IANS) Kuldeep Yadav s (6/25) heroic bowling effort restricted England at a moderate 268 runs in the first match of the three ODI series at Tent Bridge here on Thursday. Despite a deep batting line-up the hosts sucumbbed before Kuldeep who emerged with his best ODI figures at a batting-friendly Nottingham wicket. It was Ben Stokes (50) and Jos Buttler (53) who showed some resistence against the visiting bowling attack to push their side to a fighting total. Put into bat England was off to a decent start as openers Jason Roy (38) and Jonny Bairstow (38) forged a 73-run partnership for the opening wicket before Kuldeep drew the first blood dismissing the former in the 11th over. With just eight runs added on England s scorecard Kuldeep struck again to pack back incoming Joe Root (3). The wrist-spinner made worsened England s situation when he sent back opener Bairstow who was caught before the wicket leaving the hosts reeling at 82/3. Stokes and Buttler then forged a 93-run stand to inch England near the 200-run mark before Kuldeep shot another bullet in oppostion s line-up. The spinner scalped his fourth victim as he dismissed Buttler with England s scorecard readng 198/5. As England managed to another 16 runs to their score Kuldeep gave another jolt to the hosts after sending back Stokes in the 45th over. Before falling down to Umesh Yadav Moeen Ali and Adil Rashid chipped in with 24 and 22 runs while Liam Plunkett respectively while Liam Plunkett contributed with 10 runs to take their side to a competitive total. 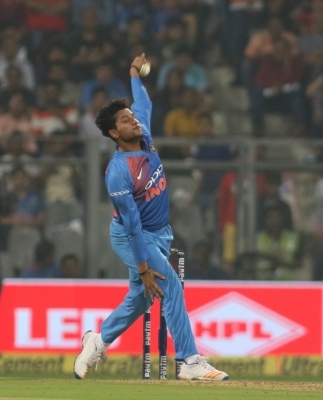 Apart from Kuldeep Umesh bagged couple of wickets leaking 70 runs from his 9.5 overs.